The Sony Xperia Z1 Compact comes with Android 4.3 out of the box, while its big sibling launched with 4.2.2. Still, the software looks very much the same and that was on purpose - Sony didn't set out to just make a compact phone, they wanted exactly a compact Xperia Z1. There goes our usual demo video to get you started. Those of you who have used the big Z1 will notice how familiar it looks and those who haven't will get a feel for Sony's latest UI. The multiple lockscreen panes contain one widget each. A swipe to the rightmost pane will fire up the camera (the stock Android setup). Widgets are collapsed by default, but you can swipe down to expand (and back up when you're done and want to unlock the phone). The homescreen panes can accommodate various widgets: Email, Gmail, Google Now, Calendar, Google+ posts, TrackID and Digital clock. You can download apps from the Play Store that add new widgets. When the music player is on, the lockscreen will display the music controls by default, but they can be swiped out of the way. You can also enable Face, Pattern, PIN or Password unlock, in ascending order of security. The Xperia Z1 Compact lets you add or remove homescreen panes (you start with five) and set any of them as default. You can't have more than seven panes at any given time though, nor can you change the order they're in. The background for the virtual on-screen buttons is black when you are running an app and completely transparent when you are browsing homescreen panes and menus. Some of the basic apps (phonebook, messaging, calendar, etc.) set both the status bar and the on-screen button background to grey instead. To add stuff to the homescreen just tap and hold on a blank area or pinch to zoom. A context menu appears, allowing you to apply various customizations: add widgets or shortcuts, change the wallpaper and the theme. Shortcuts can be pulled from the app drawer and dragged across to the homescreen. The Xperia Z1 Compact has a few custom-made Sony widgets for various social services, connectivity toggles, the Walkman player, etc. The widgets in the Xperia Z1 Compact do resize and re-arrange automatically when you're trying to place them. Along the bottom, there are four docked shortcuts (two each side of the app drawer shortcut). These are visible across all homescreen panes and are user configurable: they can be either single icons or folders with multiple items, in which case you get smaller icons of the first four shortcuts in them. The notification area features a few toggles (Sound, Bluetooth, Wi-Fi and Brightness by default). There's also a quick shortcut to the settings menu. The toggles are customizable and you can choose between 16 different quick toggles and have up to 10 of them visible in the notification area across two rows of shortcuts. You can even opt out of having the Settings key. The notifications themselves have not changed - they can be expanded to reveal more info and collapsed to save space or dismissed with a sideways swipe. Sometimes they also have helpful buttons on them, such as "Call back" or "Send SMS" on a missed call notification. The app drawer is laid out across multiple pages and you can sort the apps manually, alphabetically, by the most used or most recently installed. The menu with those settings is accessible via a swipe from the left edge of the screen and you can also search and even uninstall apps from there. If you tap and hold on an app, a green Add to Homescreen field will appear on top of the app drawer. Just drag the icon and drop it there and you will go back to your homescreen and place a shortcut. The Xperia Z1 Compact uses the stock Android task manager that lets you switch between recently opened apps, as well as terminate them with a side-swipe. 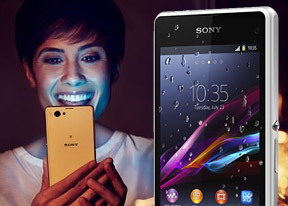 The so-called "small apps" introduced with the Xperia T are enabled too. They are similar to Samsung's Mini Apps, and pop up tiny widget-like applications on your homescreen, which you can move around and use without having to open the full-fledged app. So far, there's a default set of nine: Active Clip, Chrome Bookmarks, Browser, Calculator, Calendar, Gmail, Timer, Notes, and Voice Recorder. You can launch only one instance of a Small App, but you can open multiple Small Apps simultaneously. There's a choice of both static and live wallpapers for the Z1 Compact. As usual, you can preview the live wallpapers before applying them. Applying a new theme changes the lockscreen and homescreen wallpaper and the color of the system icons (toggles, menu icons, etc.). Sony has added its own Backup & Reset feature for Android OS. It works for apps you've uninstalled and then reinstalled again, all of your multimedia content is saved too, and all system apps such as messaging, call logs, etc. get their data stored safely. Restoring is easy so you can easily bring back anything you may've lost.